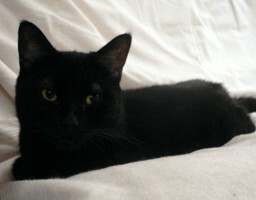 Gracie was delivered to us as a feral from the housing projects in Dorchester. For months, she would hiss and strike if anyone were to come within 5 feet of her. She pretty much spent her days sleeping in the same exact spot on the futon. She is such a cute cat though, and her meanness became almost adorable. Many of our volunteers just wished that they would some day be able to cuddle with her. We began employing a technique for taming feral cats with Gracie, which involves bribing cats with pureed tuna and chicken. They are just so tasty, that even the most ferocious cats can't resist. Gracie was stubborn at first. When presented with a spoonful, you could see Gracie sniffing and swallowing (obviously wanting to take a lick), but she would turn the other way and pretend it didn't exist. After a few days of this, she finally couldn't resist and took a lick. Soon we were able to feed her out of our hands - a huge improvement - but she still would not let anyone pet her. After a while, being mean and not letting anyone pet her became a game to Gracie. She would pretend to close her eyes and sleep so that someone would try and pet her. The second anyone touched her though, she would take a quick but determined swipe with her razor sharp claws. A part of her genuinely didn't like being touched, and another part of her got a kick out of the whole ordeal. We had almost given up hope, when one day, we had a major breakthrough. Our Facility Director was working late one night at the Adoption Office when she saw that Gracie was unusually active. Gracie had actually decided to sprawl out on the couch instead of being crouched in her usual defensive position. Seizing the opportunity, the Director decided to sit next to Gracie and see what would happen. Miraculously, Gracie got up and began rubbing herself against the Director's back. Next thing we know, Gracie was purring and wanted to be pet. It was as though some sort of switch was flipped in Gracie's mind from antisocial to lap cat! The two of them cuddled happily for the rest of the night. Later that week, Gracie even came and sat on the couch in between a couple of volunteers during a training session and let everyone pet her! We were so proud of her! However, this change in attitude has not become a permanent thing yet. She currently goes back and forth between her antisocial and lap cat identities, and we never know which cat she will be on a given day. Nonetheless, things are looking way up for Gracie. Gracie has now been in foster care for a few weeks, and her transformation has been unbelievable. Almost instantly, she has turned into a lapcat. She's turned into a very chill cat who does not mind putting on a harness and being carried around outside. During CARE's very first Adoption Day at the Adoption Office, she tolerated being outside in volunteers' arms for over 4 hrs straight! She has even learned a few tricks, and can now sit and give paw on command (watch the youtube video)! As wonderful as Gracie has become, she can be a little wary of new people/situations. She will need to go to a quiet home with adequet experience, with no children or other animals. If you are interested in adopting Gracie, fill out an application here and we'll be in touch!